In 2013 a good, clean, average mileage Aprilia RST1000 Futura can be had in the UK for £1,000 – £2,500 on average, with the later RS Touring two tone bikes going for a little more. This is not a hard and fast rule. In mid 2010, Futura 001 turned up on ebay, un-registered and unused, with an asking price of £4,600. As with all bikes with short production runs that remained largely unchanged, you should buy purely on condition, rather than age. In any case, year of first registration can bear no relationship to build date. With Futuras out of production for over ten years, condition is more important than ever. Good ones are getting harder to find and conversely there are a fair few bad uns out there now. There are also many crash damaged bikes that have been patched up with parts from other bikes – buy with extreme caution. For standard bikes (or those with sensible mods), mileage is pretty immaterial if the bike’s been looked after. Most have done between 10,000 and 30,000 miles by now – but some have done a lot more. At least one has done 100,000. The bikes age vastly differently according to how they have been looked after. In the UK electrics in particular seem to suffer worst if exposed to road salt, but recently there have been one or two cases of used bikes with parts missing from the rear wheel, so look at the owner as closely as you do the bike. A service history is good but not essential if the owner is a competent mechanic, but panniers (assuming you want them) are worth having and will cut out the hassle of having to find some. Other than that, mods are down to the individual. Check to see whether it’s a parallel import. Lift the seat and you’ll see the spare parts ID sticker next to the battery. This will tell you year of build and the country it was originally intended for. It shows build year (between 01 and 03, despite what anyone says) and the country the bike was intended for (this one’s a German import). If the punch is anywhere other than the UK mark, it’s a parallel. Later models have only EU, UK or US (+ California) model designations. If it is a parallel, make sure the headlight dips to the left. Replacement lights are bloody expensive and come up on ebay once in a while. A right dipping headlight can mean an MOT fail, though some testers will let you block it with a deflector sticker while others ignore it completely. Another warning sign for a parallel is temp and fuel readouts on the clocks in metric rather than imperial measurements. That said, the headlight is the only issue with parallels and if it dips to the left, you’re fine. If the bike is low miles, check the age of the tyres. If they are more than 5 years old they should be binned – it’s a bargaining point. The two must-do mods – the Wiring Mod and the fuel quick disconnect should have been done, but are easy enough to do yourself so aren’t deal breakers as such. Ask the owner (or check for yourself) if these mods have been done: A chat with the owner about these issues will give you a good idea. Other than that it’s mainly the stuff you’d check for any other bike. The motors are bullet proof and will withstand all but the most appalling abuse so there’s nothing special to look out for here. In any case, breakers are full of unsold Futura motors. But while the engines stand up to a degree of neglect, the electrics do not and neither do some cycle parts, expecially the rear wheel assembly and shock bearings. In Ireland and other countries where the Futura came with Marzocchi forks instead of Showa, the forks have been known to corrode and peel in a most alarming manner, even if the bike has been looked after. 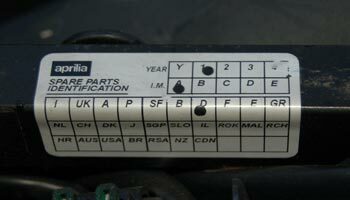 And if you’re new to the bike, you’ll do well to see this website’s guide to setting the dash.